Fasehun, it was learnt , died in the early hours of Saturday at the Lagos State University Teaching Hospital, Ikeja . The octogenarian , it was learnt , was admitted at the Intensive Care Unit of the hospital on Tuesday where he remained until his demise . 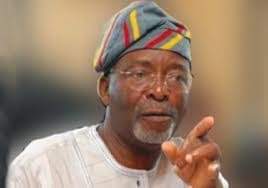 Confirming his death to our correspondent on the telephone , Fasehun’s spokesman , Mr. Adeoye Jolaosho, said the late OPC founder was confirmed dead after a brief illness. “ It is true, baba died this morning at the ICU in LASUTH, Ikeja , ” he said . He was a medical doctor and hotel owner and was responsible for the recent revival of the Unity Party of Nigeria, a party formed by the late sage, Chief Obafemi Awolowo in the 1970s . He studied science at Blackburn College and furthered his education at Aberdeen University College of Medicine . He also studied at the Liverpool Postgraduate School after which he had a Fellowship at the Royal College of Surgeons , according to Wikipedia . In 1977 , he set up an Acupuncture Unit at the Lagos University Teaching Hospital. He resigned in 1978 and immediately set up the Besthope Hospital and Acupuncture Centre in Lagos . The Acupuncture Centre once earned a reputation as Africa ’s first for the Chinese medical practice . The OPC is a Yoruba- based organization formed to actualise the annulled mandate of Chief MKO Abiola, who won the presidential election of 12 June 1993 but was barred from office. Fasehun was imprisoned for 19 months from December 1996 to June 1998 during the military rule of Sani Abacha .